Collection>The danish golden age>J. Th. Lundbye>Lundbye J. Th. Oil on canvas, 77 x 104 cm. In line with the national Romanticist ideas at the time, Lundbye ventured out of the city and into nature to pursue his craft. He was particularly fond of painting the open panoramic Zealand countryside. 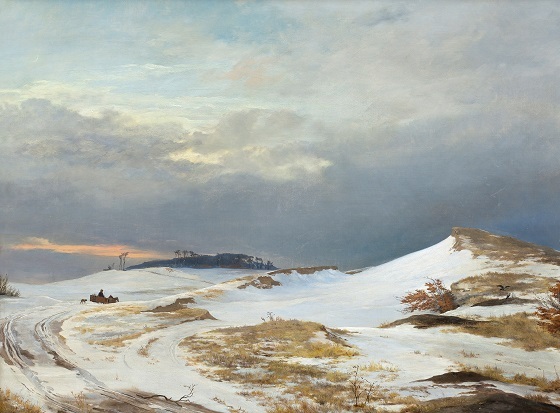 This bleak landscape, marked by a frosty stillness, is a relatively rare subject during the Danish Golden Age as wintry landscapes were not suited for plein air painting. The composition is broad and harmonious with a massive, fluctuant sky and strong focus on the role of the lines. The blanket of snow covering the hillsides, the tracks from the sled and the reddish glow of the late afternoon sky fills the viewer with a sense of something grand yet desolate. Lundbye belongs to the youngest generation of Danish Golden Age painters. His speciality was painting animals, but it was his landscape paintings that defined his career. Influenced by the Royal Danish Academy of Art professor J.L. Lund among others, Lundbye adopted a Romanticist approach to art early on. His paintings were far more atmospheric than those of other Golden Age painters such as C.W. Eckersberg and his students. He was accordingly one of the artists who helped engender the breakthrough of National Romanticist landscape painting, which earned him no small amount of accolade during his time. Lundbye was very interested in literature, finding inspiration for his paintings among the works of writers such as Søren Kierkegaard. He voluntarily signed up to fight in the First Schleswig War in 1848, but it is generally believed that he was killed by an accidental shot before he had the chance to fight in an actual battle.